Do you know How to Crop and Save Image using Jquery and PHP. For this we here we have disucuss topic like How to Crop Image while uploading by using Jquery with PHP Ajax. 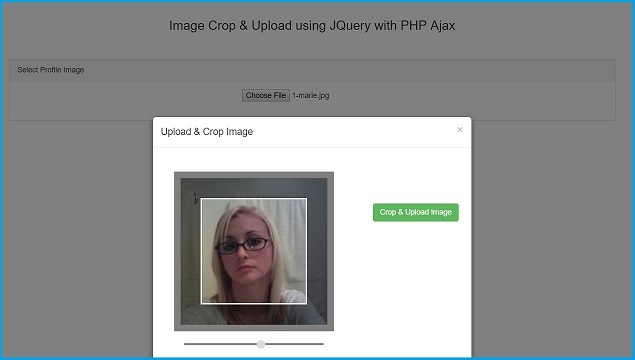 Here we have use JQuery Croppie plugin for Image crop with PHP Script. Image Crop is required feature while upload of image, because user upload any size of image to website, but we want to required to upload same height and width image, so at that time if we have provide image crop feature to user then he can upload same size of crop image to our web site and we can received same size of all image. This type of mostly required at the time of upload of profile image. In this tutorial we have use Bootstrap Modal for Image crop by using JQuery Croppie plugin. This plugin has been initialize by using croppie(). Under this method we can also define option as per our requirement. In this plugin there two type of image crop available. First type is circle, by using circle type we can crop image in circle and other is square that means we can crop in square size also. In this method we can also define width and height also. After this we want to write jquery code on image select by using file tag. In this event we want to activate croppie plugin on selected image and bootstrap modal will be pop up with croppie plugin and there we can crop image by click on image crop and upload button. When we have click on button then this plugin will send image in base64 format and this image format we will send to php script by using Ajax. In PHP script we have use file_put_contents() function, this function will create crop image under our working folder. This is complete discussion of Live Image crop and upload by using JQuery Croppie plugin with PHP script with Ajax. Does this plug-in have the option to rotate the image or correct its orientation? how do i upload multiple images using croppie ? why the file cannot open ?